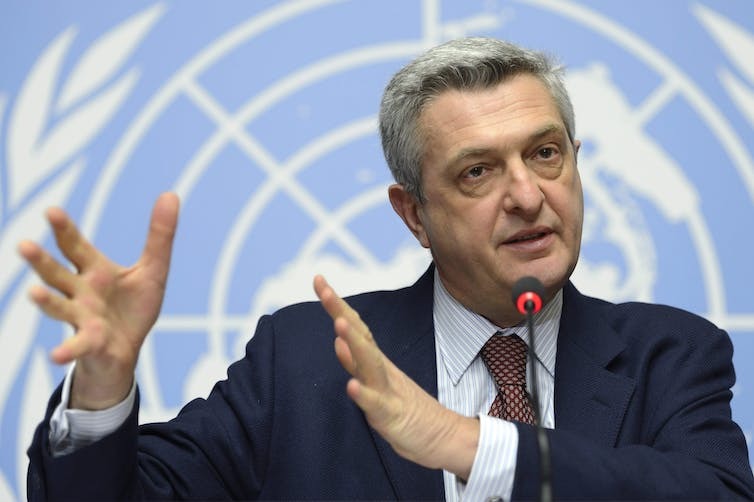 Filippo Grandi urged an immediate end to Australia’s offshore processing of refugees. The United Nations high commissioner for refugees (UNHCR), Filippo Grandi, has accused Australia of breaking its word by refusing to allow refugees on Manus Island and Nauru with family in Australia to settle here – a claim denied by Immigration Minister Peter Dutton. In a strongly worded statement on Monday, Grandi said that last November the UNHCR “exceptionally” had agreed to help with the relocation of refugees to the US, when the Turnbull government struck a deal with the outgoing Obama administration. “We agreed to do so on the clear understanding that vulnerable refugees with close family ties in Australia would ultimately be allowed to settle there,” Grandi said. But “UNHCR has recently been informed by Australia that it refuses to accept even these refugees, and that they, along with the others on Nauru and Papua New Guinea, have been informed that their only option is to remain where they are or to be transferred to Cambodia or the United States,” Grandi said. This meant some people with serious medical conditions or who had had traumatic experiences such as sexual violence could not receive the support of close family members who are living in Australia, he said. A spokesperson for Dutton responded to Grandi’s statement by saying the government’s position “has been clear and consistent” – people transferred to regional processing centres “will never settle in Australia”. On the ABC’s 7.30, Volker Turk, the UNHCR’s assistant high commissioner for protection, elaborated on the claim. He said the UNHCR went into its facilitation role “after long discussions with Australian government officials”. “We had a lot of meetings with the government, including myself with the minister of immigration in November,” he said. Only 36 people had so far been identified with such links, he said. On the basis of the understanding that it had the UNHCR “presented these compelling cases”, Turk said. Grandi said these vulnerable people who had already had four years in “punishing conditions” should be reunited with their families in Australia. This would be the “humane and reasonable” course. “The Australian government’s decision to deny them this possibility is contrary to the fundamental principles of family unity and refugee protection, and to common decency,” he said. Grandi said Australia’s offshore processing policy “has caused extensive, avoidable suffering for far too long”. “Four years on, more than 2,000 people are still languishing in unacceptable circumstances. Families have been separated and many have suffered physical and psychological harm,” he said. The UNHCR has referred more than 1,000 refugees to the US over the past eight months. A further 500 people are waiting for the outcome of their refugee claims, being processed by authorities in PNG and Nauru. The American deal provided for the US to take up to 1,250. US President Donald Trump made it clear in his much-publicised phone conversation with Malcolm Turnbull that he hated the deal, though he has said he will honour it. But so far no-one has been settled. The US, which is doing its own assessments, has been slow, and now America has filled its much-reduced refugee program for the year ending September. This has stalled any prospect of departures until the new year starts in October. Meanwhile the Manus centre is due to close on October 31, and authorities there are trying to push people out of it. Asked on Sky on Sunday whether there was any circumstance under which the government would allow some people to come to Australia, Dutton said: “People will not be coming to Australia … the government has said it consistently”. Pointing to the earlier 1,200 drownings at sea, Dutton said that under the Coalition’s “Operation Sovereign Borders we’ve not seen a single death at sea”. Grandi said the UNHCR fully endorsed the need to save lives and prevent exploitation by people smugglers. He urged an immediate end to Australia’s offshore processing and for it to offer solutions to its victims “for whom it retains full responsibility”. Labor called on the government to release the details of the US-Australia resettlement agreement, including any side deal made with the UNHCR.